was there a verticle shadow hitting Lovelady's right shoulder? If so then doesn't that make the idea of anything on PM above waist height being exposed directly to the sun seem very unlikely? And please look too at the base of the bottle again as it's probably being lifted to his lips, and as Ray did with Darnell, compare it to any item near those steps that we know for sure was exposed to the sun. And that is all I am going to say regarding that lot. Now then I'd like to point something out that most people do not seem to realise. The sun and the shadow, are not two extremes as much as some would like us all to believe, sure we are looking at multi generational copies and the contrast has been increased due to that copying, the mid tones suffer due to this. What I am steering towards is this. There is a zone of transition between the edge of the sun and the shadow. How big that may be, I leave that to the scientists but things do not go from white to black just like that. It is my belief, that the bottom of the bottle hit that transitional area. Oswald himself stood further away in that shadow and would be in a darker gradient zone than the bottle since it is in front of him. Now then can we all work on getting the damn films which are held by the 6th floor museum and NBC (both have acknowledged thru Gary Mack and a rep. from NBC that they have them). And until 8K scans come forward you dance around this stuff until the cows come home. So you want to disprove Prayer Man is not Oswald then work on getting the films. If you want to prove Oswald is Prayer Man you try and get the films as well. "edit" Y'all realise that the pix are just the icing on the cake yes? 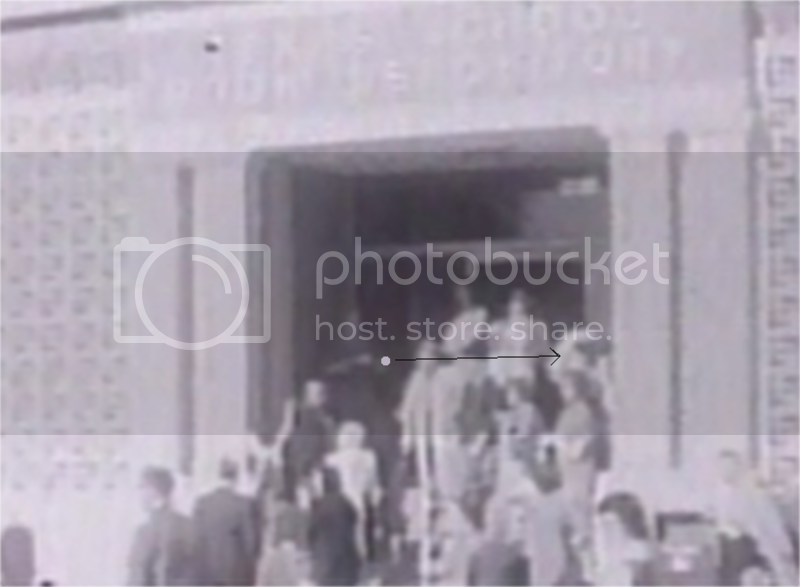 If it's Oswald, is the fact that he was seen with a bottle in hand on lunch break the factual grounding for the false Marrion Baker "Coke bottle" encounter story? Moving PM away from the west wall (as you did) can indeed make it look like he is further back toward the glass.... that is, if we don't see his legs and feet. But I have a new criticism. (Sorry.) With one foot on the landing and the other one step lower, I have a hard time believing PM would maintain that awkward pose for an extended period of time. Yet we see him in what appears to be a static position, first as the procession is passing by, and then again after the shooting, when officer Baker is running toward the TSBD. If PM truly was near the front of the landing, I think it's more likely that he had both feet one step below the landing. That said, I am still of the opinion he was back close to the glass. FWIW. 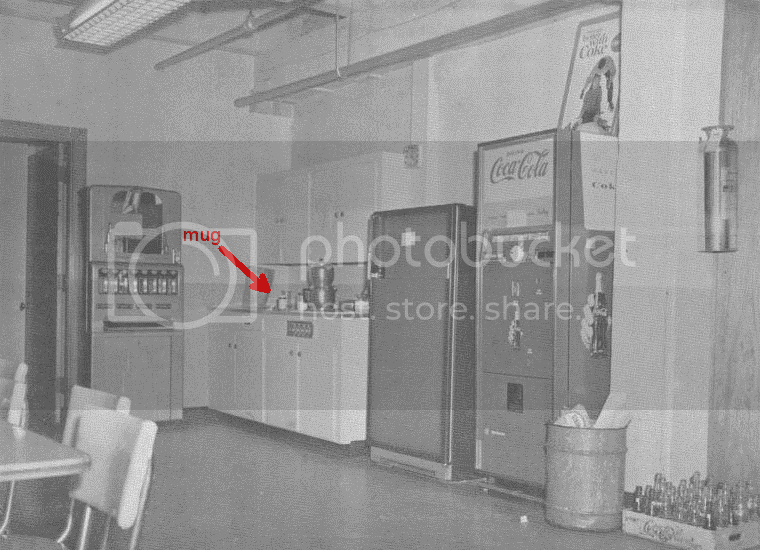 Could well be David, just like that me and a few others think that Oswald fed Fritz the 2nd floor lunchroom idea. the posture looks a bit awkward at the moment, I agree, However, all other markers (vertical rail of the left-most pane, the relative height of the tip of PM's head and Frazer's neck, PM's head and trunk in the shadow whilst his hand reflecting sun light) hold well. The distance between PM's trunk and the red brick wall in the picture posted in response to Ray's comment appears very appropriate. As per the exhausting posture, there can be again different solutions to it, and I will for the start adjust the left leg to a bit more realistic position. As you point out, we do not see PM's legs and therefore, my suggestion as to his left leg is a bit speculative. I am afraid that there is no way to place PM on the top platform with both his feet resting on that platform. PM would appear be too tall relative to Frazier's neck. I have posted a solution with PM being 5'3'' and standing on the top landing which you find in one of my previous posts (the very first post introducing this solution) and you can see that this solution was not too good. PM (5'9'') on the top landing would not only appear too tall but he would also be relatively cose to Frazier (closer than in Darnell) if we want his right hand to reflect sun light. The solution proposed here is the only solution (with some deliberate decisions about exact position and shape of his legs) which suits all ad-hoc accepted constrains: 1. PM' body height o 5'9'', 2. top of his head at the level of Frazier's neck, 3. the corner vertical rail crossing PM's body, 4. his right hand exposed to the sun. To illustrate the problem of having PM with both feet on the top landing, I have prepared a four-PM doorway. All PMs are 5'9''. Starting from the outside of the doorway, the first PM is the one standing with one foot on the first step (still showing a bit awkward stance). 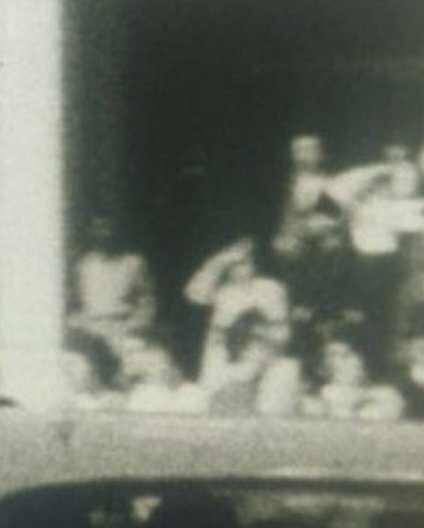 The second PM stands on the top landing, his head is also crossed by the corner rail, and his right hand exposed to the sun. 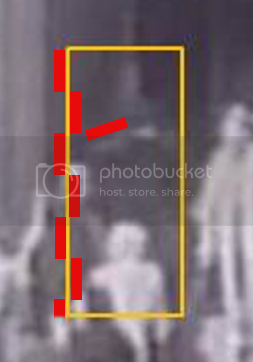 The third PM is well inside the doorway, his right hand reflects the sun, however, the vertical rail does not cross PM's body. And finally, the fourth PM is standing behind the glass door for comparison purposes, which I remember popped up in one of your previous posts. From the first three PM's only the first one would meet all these criteria: 1) being 5'9'', 2. the vertical corner door rail crossing PM's body, 3) the right hand reflecting the sun, 4) the top of PM's head being at the level of Frazier's neck. The second PM would appear too tall relative to Frazier and therefore, this solution can be refuted. I will now adjust PM's stance and reduce Frazier's height to 6'0'' (he is currently 6'1''), and prepare some pictures that would help to verify which I hope will be the final solution. Thank you for your comments which helped a lot in refining this solution. The average mature males ulna is about 6.4 'ths of height. The person is standing near the corner having an after lunch cuppa in a white mug. If it had sun shining on it it would be much brighter. The persons presence didn't register well as eyes are adjusting to dark after the bright sun when heading back indoors. Richard Trask, on p. 424 of Pictures of the Pain, estimates the Camera Car 3 distance in the pertinent Darnell footage as "some 70 feet from the closest point of the building." That correlates very well with the scale drawing on the inside cover of his book. For those without the book, a portion of that drawing is at jfkinsidejob.com on p. 4 of my essay. This sets Frazier, to a close approximation, at 75 feet from the camera. The height calculation via the Drew Phipps method remains the same, since we are talking the same 2% or so loss to PrayerMan's height due to perspective. PrayerMan's distance from the camera works out to (47/46)(75) = 76.6 feet. I have found a 3rd method for calculating height- really just a corollary of the Phipps method, using the vertical border-strips behind Frazier & PrayerMan- and won't elaborate on it here. The Wiegman gif contains two incontrovertible facts which lead to the same devastating consequence for the Murphy thesis. A copy is in the last post by Robin Unger on p. 566 of the Prayer Person giga-thread at http://jfkassassinationforum.com/index.php/topic,8916.4520.html There is no bluffing around this consequence. 1) When PrayerMan lifts his elbow, so little of the dark-tiled west wall is visible left of his elbow, that he must be at or near the front edge of the landing. This is better appreciated by lookiing at the adjacent pictures Robin posted. The dark tile extends almost two full step-widths, about 1.5 feet, beyond the landing. 2) The vertical border-strip of the glass partition can be discerned at PrayerMan's right (the viewer's right), almost defining the right-hand edge of his body. Whereas in Darnell the vertical border-strip bisects PrayerMan, Wiegman's camera-line is slightly to Darnell's right. The distance from the sepia-colored brick column to the lifted elbow, and to the vertical border-strip, can be measured and compared. The lifted elbow is no greater than 25% of the distance to the vertical border-strip. For a 4.3 feet-wide landing with a 1.5 feet extra dark-tiled width, (5.8)(.75) = 4.35 feet, which tells us that PrayerMan is at the front edge of the landing. And his elbow is probably extending a little bit beyond it. And so we have two forensic facts in Wiegman that dovetail into the indisputable conclusion that PrayerMan is standing at the front edge of the landing. Which means a firm comparison can be made heightwise with Frazier, who was nearly coplanar with respect to Darnell's camera. A small draftsman's compass easily confirms this. I'm sure a computer-graphics specialist can arrive at a more precise determination than the result obtained from my aging mechanical-drawing skills, which put PrayerMan at about 5'4". There is also the complaint that the added step-height would make him too tall to be Oswald. I do not have the measured step-height, but have made a rough estimate as follows (see Tony Fratini's picture of the empty entranceway on p. 511 at http://www.jfkassassinationforum.com/index.php/topic,8916.4080.html): a standard US Mail box is 49.5 inches high, and about 3 inches above it is where the beveled edge of the base of the double-pillared column equals the height of the landing. So (52.5/7) = 7.5 inches per step, leading to the approximation that PrayerMan, if he were standing on the next step, would be 5'11 1/2", significantly taller than Oswald. This is a wonderful opportunity for someone, disposed to computer graphics, to give us a bird's-eye view of Darnell's camera position, and the landing, and the street-level view seen in Darnell and Wiegman; adding in the appropriate photogrammetry lines to help describe what I properly refer to as the Doyle-MacRae photo-theorem. Otherwise, the research community does not seem to me much better than a herd of thirsty wildebeest, ignorantly marching toward a river full of crocodiles. The mainstream media will eat us alive when the expensive digital scan proves that PrayerMan is not Oswald. Some type of white mug or medium size cup does seem to tick all the boxes in Wiegman John and you can see him still holding it in Darnell too, if you want to. Perhaps Richard might like to answer the above question. I now looked at the two different photos at link (post 131) to robins. Obvious. Away from corner by wall, on landing, not step, in shadow, cup, ~5.4 ft..
Ray Mitcham- Perhaps whoever believes the sun is striking PM's hand can explain the considerable difference in the RGB values. PM's forearm and hand are being illuminated by indirect sunlight. From a diffuse (non-pointlike) source such as the sun, a distinct intermediate zone- a sliver- between direct sun & deep shadow will impact the target. Like the penumbra during a lunar eclipse. There is a gradient of brightness across the width of this sliver. In the Wiegman gif the hand begins within this sliver and, during the motion, its brightness barely increases (to the naked eye)- this means that the hand remains the same (very small) distance from the direct sun. But the brightness of the forearm increases dramatically- it begins near the far edge of this sliver and ends at very nearly the same very small distance from the direct sun as the hand. So the overall hand-forearm motion is akin to a puppeteer, holding the hand-string still, but lifting the forearm-string. An intermediate sliver is a handy concept for Wiegman, since the shadows grow very deep very suddenly as you look into the alcove's west corner. Yet Darnell shows how scattered & reflected light modestly illuminates that corner- inside the lobby we get almost none, and it's impressive that the white radiator (highly-reflective) has been found. But the concept of an intermediate sliver doesn't apply as readily to Darnell- his film stock was evidently better at capturing low light levels. Although it's basically just a definition of convenience, imagining a 4-inch-wide intermediate sliver in Wiegman transfers over to Darnell (where it's not visibly obvious).